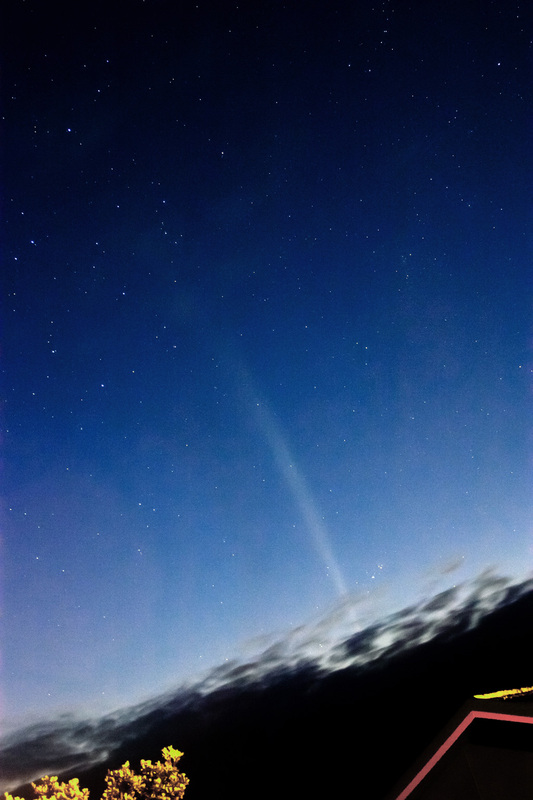 Hot off the CCD this morning, some better shots of Comet Lovejoy in the south-eastern sky. Also I expect I should do a big shout out to everyone for the holidays eh? Happy Solstice celebration all, whatever form it takes for you, from 1200mm. Love, Joy, a new star in the East... must be Christmas! 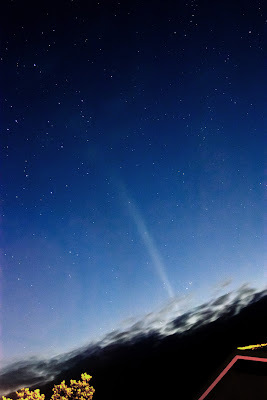 Christmas Eve down under, and an early morning wake-up call for the boys was rewarded with some great views of Comet Lovejoy. 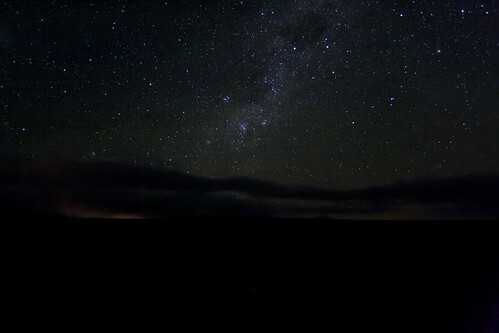 Initially we were disappointed to hop out of our beds and convene at Val's house, only to find the horizon cloudy - then realised there was a pretty glorious comet sitting above said clouds. Cue rush for cameras! Ok, so not done one for a few days, this of course means that This is going to have to be a bigger one! Enjoy the links! 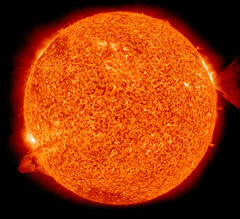 but that's ok NASA, I forgive you, just keep em coming guys! 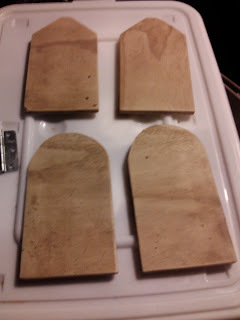 This is my first go at making a slider. It is built from 2 shelving rods, and a small moving trolley from Mitre10. It is motorized by an old BBQ rotisserie motor and pulled along by nylon fishing line. Its just over 2m long, and this version was about 35cm wide. I have since moved away from using the trolley ,and built a small slider, also reducing its width to about 15cm. with this motor it takes only 30 min to slide along the 2m rail. 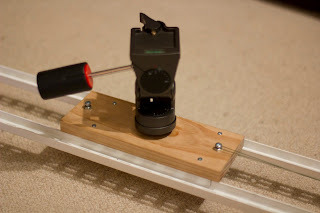 my next iteration will have a smoother geared motor, (1 or 2 RPM) enabling a longer adjustable slide time and will eventually have a pulley system in place to enable forward and reverse motion. No shots available from it yet, but we're interested to see how they look when they do come out! Especially any night shots you feel like doing bro! 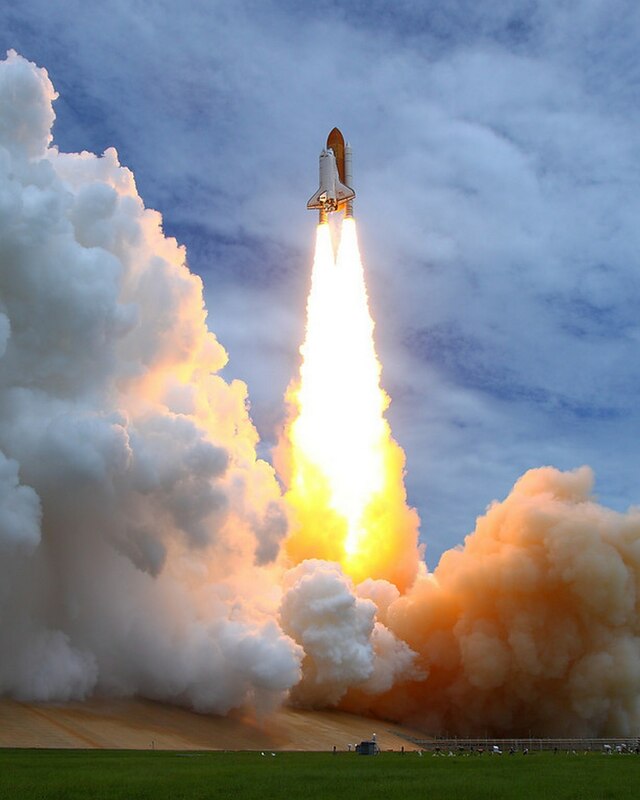 GO YOU LITTLE BEAUTY GO!!! Below you can see some pics of the tracker assembled. The black spray paint was an added cost, but well worth it I think, for that extra touch of class. Tomorrow, if I have a good day at work locked away writing animation lectures, I'll post pics of the electronics. And I will try to take a picture of the camera on the tracker, for which I will have to dig out a mirror or another camera, for obvious reasons! Some of us aren't at work tonight, and great minds think alike apparently, so here's a shot of Venus chasing her speedy brother Mercury across the evening sky. New Zealand is apparently one of the best places in the world to see Mercury, I'd have to agree! Yup, here are the photos direct from Bill's garage of the Great Tracker Caper which I am happy to report, seems to be working pretty well! Hopefully more on that from Bill soon! 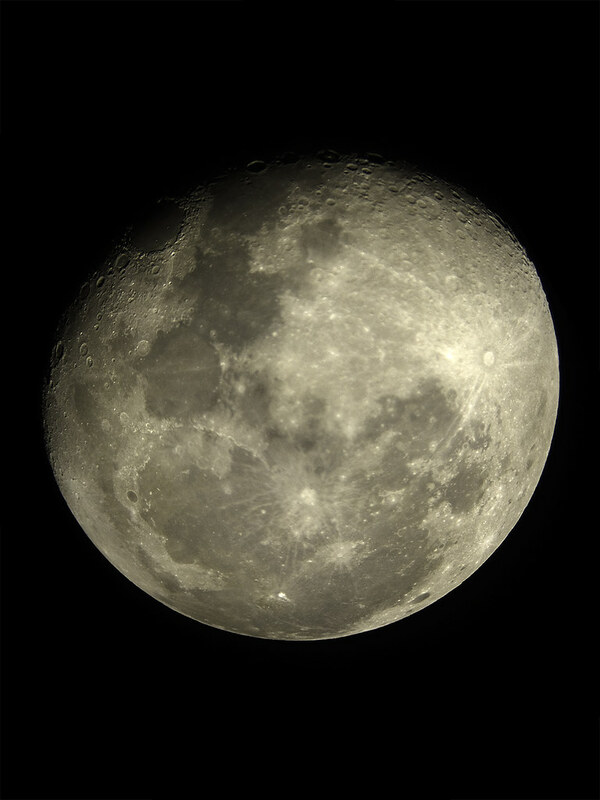 In other news, the nice folks over at DIY Photography noticed some of my moon shots on Flickr and asked me to write a quick tutorial about them, so I did! You can find it here. 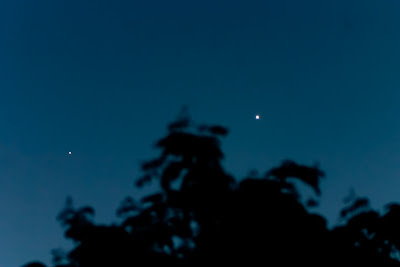 Sometimes, everything just works, a photo by Astronomr on Flickr. Few nights ago, the seeing was GOOD, and I mean GOOD. 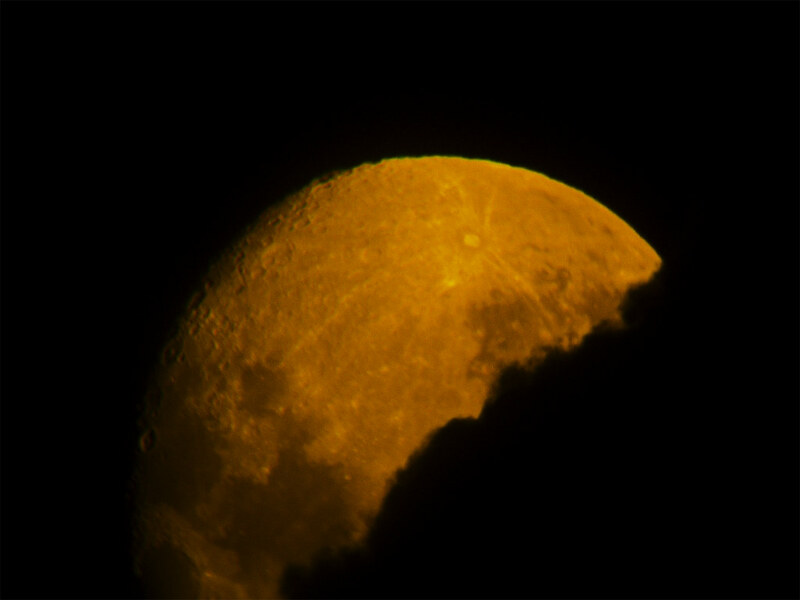 Here's a single frame of the moon, shot through the scope on the IXUS 80IS. Well, this guy just leaves us for dead I'm afraid, makes us look like the amateurs we are. But hey, it's something to aspire to and certainly something to be inspired by, assuming those are two different things. Certainly it makes me all the more eager to get our tracking mounts finished! 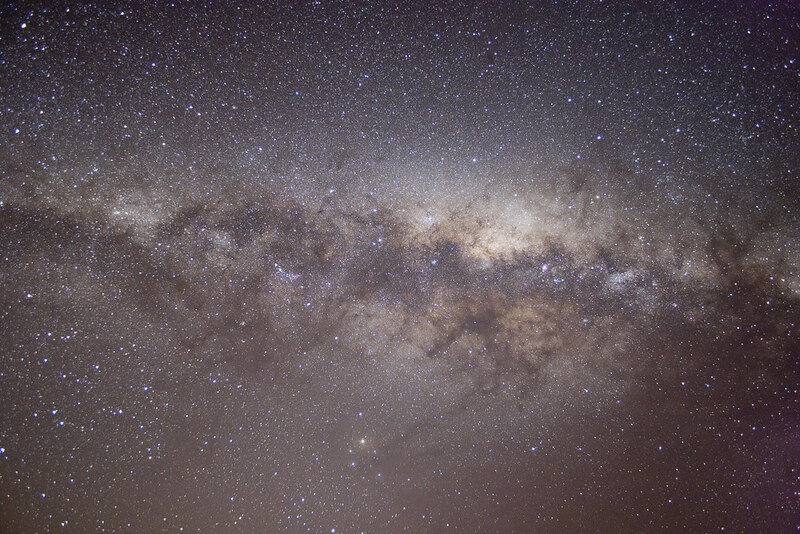 There are some nice dark skies to be had in New Zealand so while a complete map of the night sky shot by travelling around the planet is for now out of reach, I have no doubt that for a lot less money than Nick Rasinger we can achieve something worthwhile. Phew! 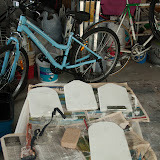 Have things been busy! As it was my birthday on Friday, the Birthday Faerie visited with cash. Cash is good. I took said cash out to see my mate Lance, and exchanged it for some new toys. Nice nice toys. 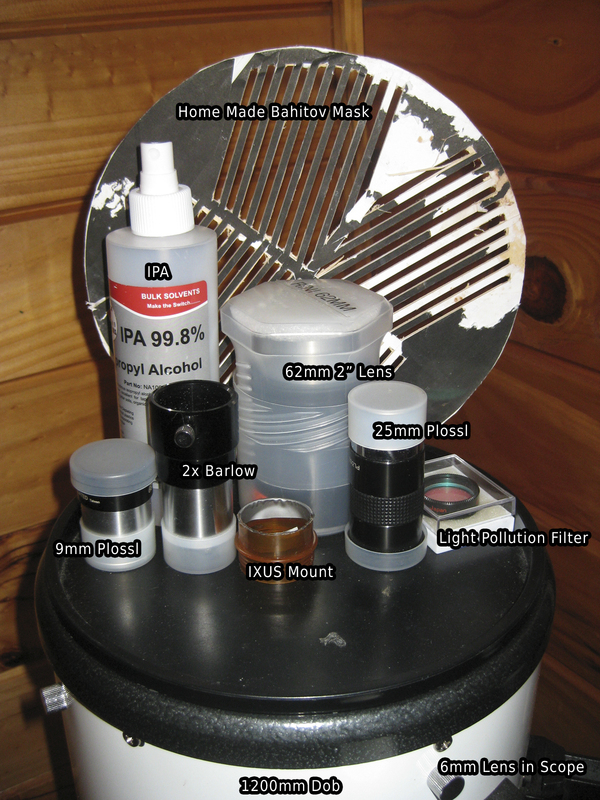 I got a variable camera projection mount and the noise pollution filter to play with :D So I thought that with new kit, I would do a kit post, not been one of those for a while :) So here's most of my kit. 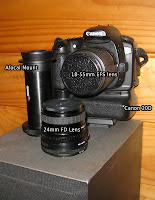 I don't take all of this out, and the camera (astroCam 2) I used to shoot these with is not shown of course. 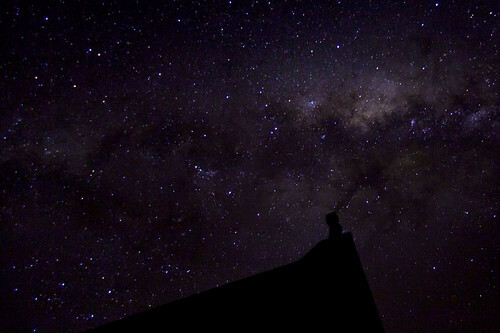 Some notes: Galaxy tab is used for geotagging, star charts and reading books whilst waiting for timlapses. 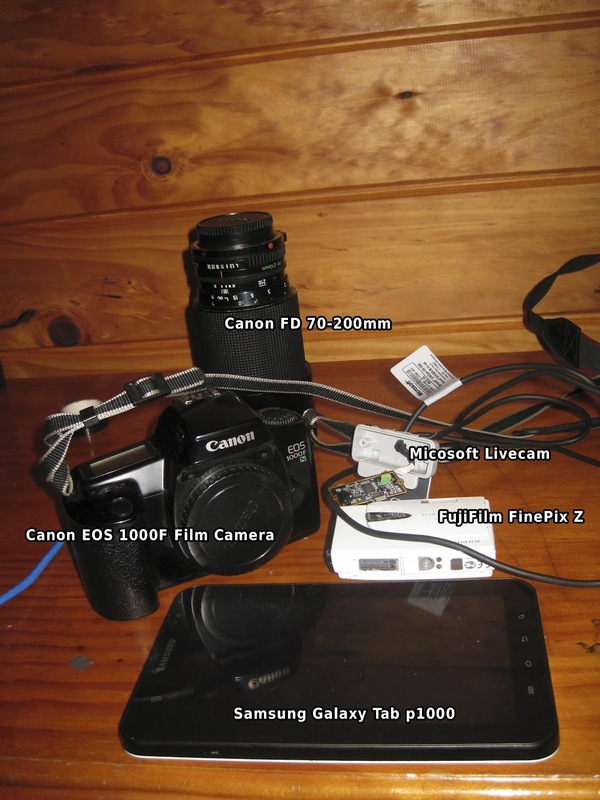 Webcam and Finepix are not in use yet, they're earmarked for prime focus stuffs, once I get them apart. Hardly ever use the 70-200mm, although its a fine lens indeed. Enough of this kit-style blather Val! Here's the first results of what can be done with them. 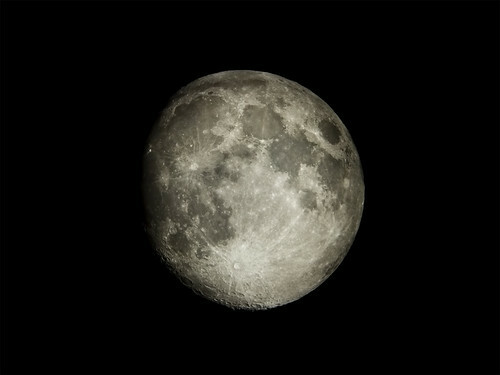 Here's the first shot through the camera projection mount, taken by Jacqui, so qualifies as her first astro shot ever! Didn't she do well? 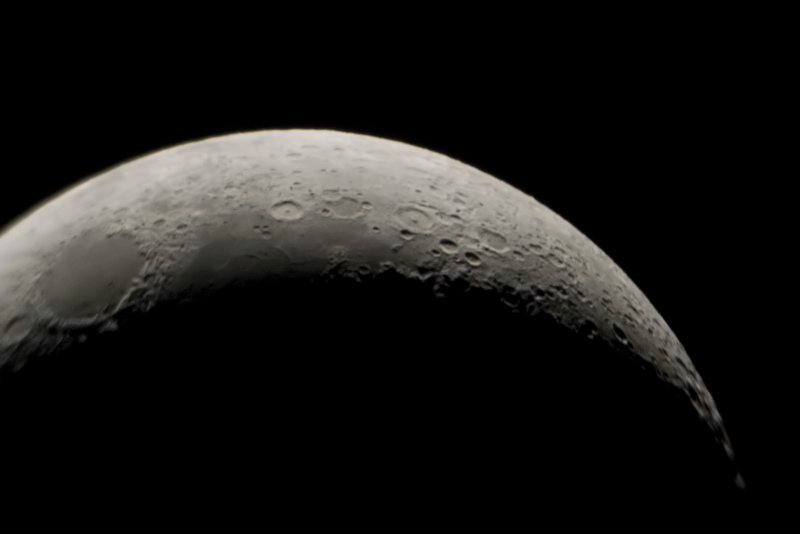 It's the crescent moon, shot on the 20D, using the 25mm mount inside the Camera projection tube. 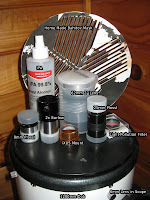 Then toinght I bodge mounted the noise pollution filter on the IXUS80 and took 2 shots through it. Done nothing but reduced the noise here. 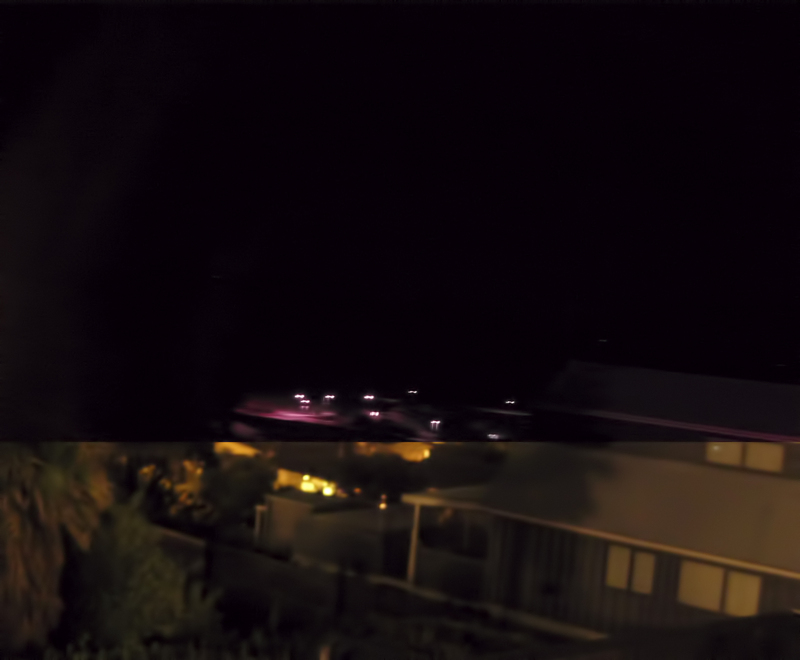 As you can see that knocks the streetlights right the hell out, so I am defintely looking forward to using this both in the scope and in the camera projection mount. I just wanted to give a big Thank You to Lance for selling me this stuff oh and the 62mm lens up there in the first Kit picture. Quite a while ago I posted a technique on eliminating/reducing star trails in your night shots. And now I have found another, perhaps easier way to make this calculation, at least for safety. This is called the "Rule of 600". Basically you take your true lens focal length (on a 2/3 sensor you multiply by 1.6, eg 18mm x 1.6 = 28.8mm) and then divide 600 by that focal length .. this will return you the longest exposure that is possible for any given focal length lens, without the stars streaking. 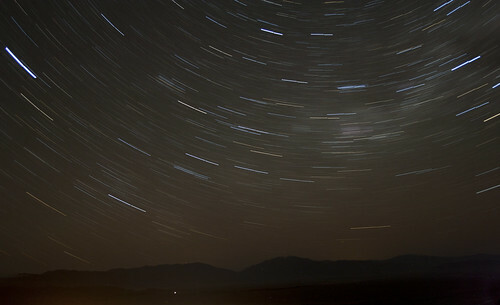 So, using the 18mm Lens, that would return 600/28.8 = 20.833 seconds before trails show up. This is of course part of one of my erratic drives to do more with this space. There's some new things coming, hopefully soon. Also, gots a little piccy from the Bill tonight ... our trackers are on their way! w00t. 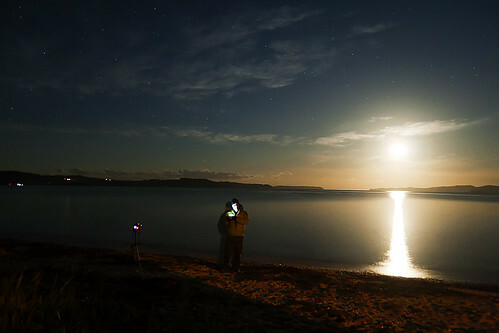 Scotts Landing TimeLapse a video by Astronomr on Flickr. 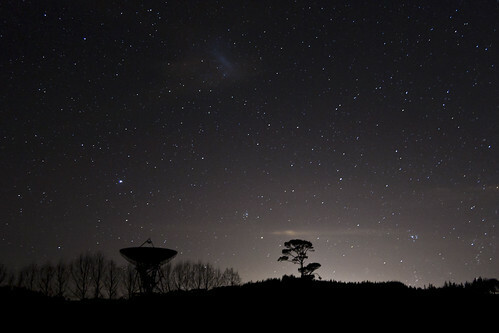 Satellite, a photo by Astronomr on Flickr. Well after tonight's world cup win for the ABs, I felt buoyant enough to attempt the climb up to the proposed new observing/photo site on Conical Hill. Well drive up there at any rate. It wasn't until I got up there that I realised that I had lent Bill the 18-55mm Lens :). However. It's nice and dark up there, with the worst noise pollution visible in the two shots above. 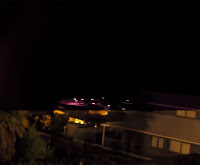 That's the glow from Warkworth/Snells Beach. The shot on the left is taken with the EF 28-80mm Lens, aperture 3.4, the shot on the right Sigma Super-Wide FD 24mm, aperture 2.8. 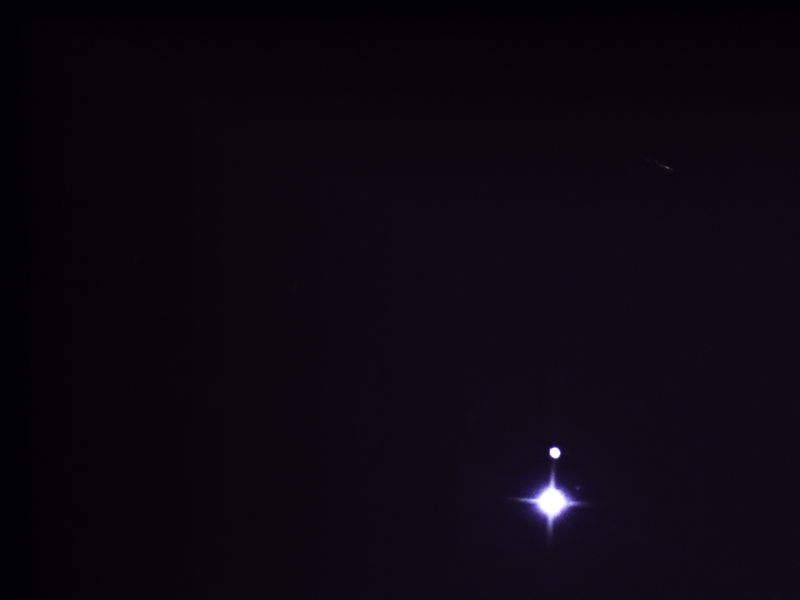 Trouble with the fast lens is how fungal it is (the stars are actually in sharp focus. So a small success, a nice dark place to shoot, and to transport scopes up to. Also gained a burning desire to procure a faster lens, as the 18-55 is nice, but could be a lot nicer. When I get more $$$ I think a fast 50 might be the order of the day. Here's a pic of the hunter to leave you with. Well, Canon Photo5 is over for another year, at least as far as my images are concerned. If you're interested, you can see how my shots look, click here, to see me being punched in the face (my powder entry), and browse my other entries if you have a mind to. So now the wait for November 9 begins, which is when the Judges announce their decision and open the briefs for voting. In location news, Bill and myself went out yesterday, searching for somewhere dark, and high. Upshot is we think we found somewhere. The top of Conical Peak Road is at this stage, looking very good for our new favorite photo and observation spot. Also we're hoping that our attempts to attract like-minded people to join us up there is successful. While I try to win a 5D in the Canon Photo 5 competition. Wow, people liked that one! The Way and the Cross, a photo by Astronomr on Flickr. One of the Church Attempts, this is the Church of the Good Shepherd in Tekapo - the clouds were pouring in fast that night, so I was rushing around trying to get some shots. This is perhaps the best of the evening. 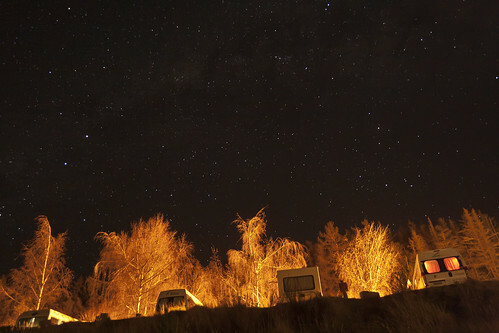 Tekapo Motor Camp, a photo by Astronomr on Flickr. 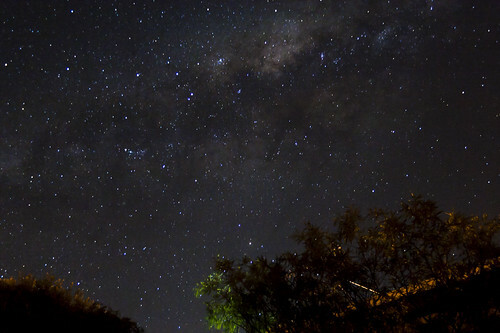 Treated Milky Way, a photo by Astronomr on Flickr. Here's what happens when I get a little fired up over post. This is from the same mt john tracker batch, with heavy contrast adjustment and post. Also some NR. Makes we wonder where to take this blog really. Can't afford the top-end gear, so hence the journey ... anyone want to lend me a 5D Mk II for a year? 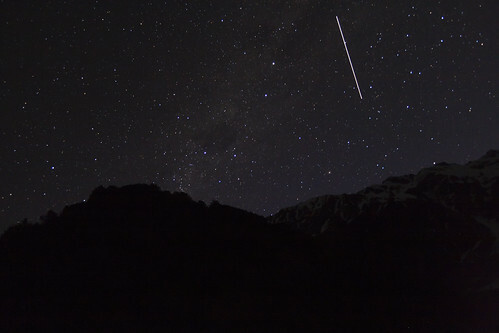 Southern Cross and The ISS Passing over the Southern Alps, a photo by Astronomr on Flickr. 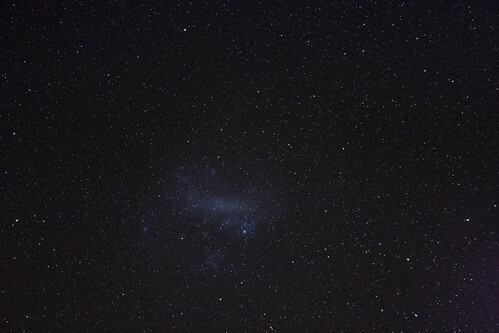 LMC and Tarantula, a photo by Astronomr on Flickr. 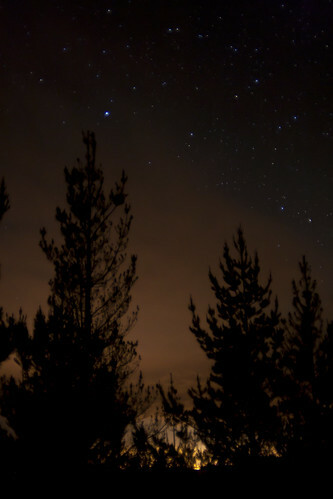 Let me tell you all about the trip to Tekapo - there was fretting! The weather was playing silly buggers half the time and in the end we ended up driving back to Tekapo from Mt Cook to go on the tour. I should say tours. We stayed up there for 3 tours. The Earth and Sky guys and girls were just the best. 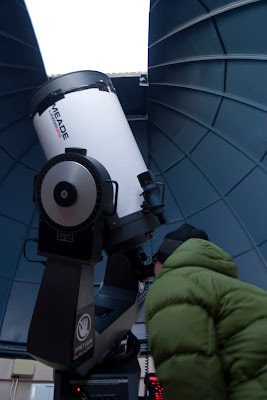 I wanted to say a HUGE thank you to Chrissy, Matt, Christian and Chris, and of course Maki who put up with a totally spastic amateur astro-photog asking all kinds of dumb questions and gonig squeeeeeee all over the tracker. The photos going up on Flickr and here at the moment are a combo of my own efforts, and the ones I got up at Mt John with the help and support of the tour guys. I really couldn't recommend these guys higher. K, K, shutting up now. Here's me squinting through the Big Scope! 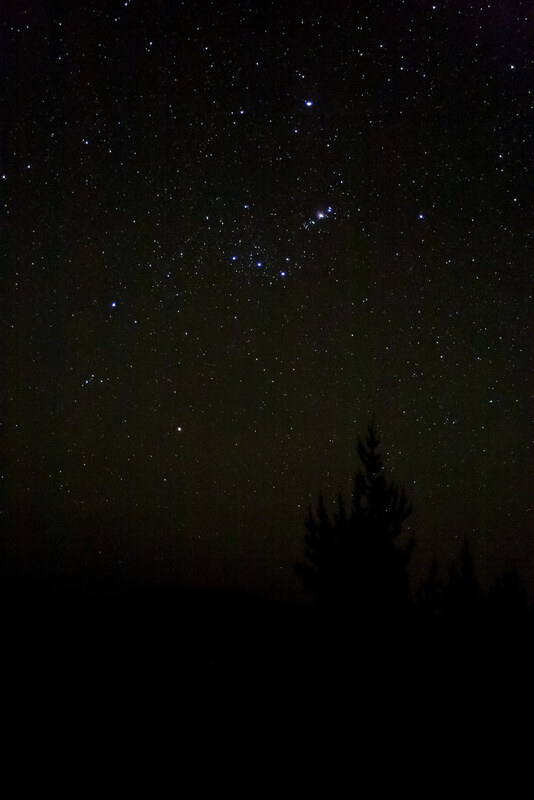 25 Minutes of stars over Tekapo, a photo by Astronomr on Flickr. 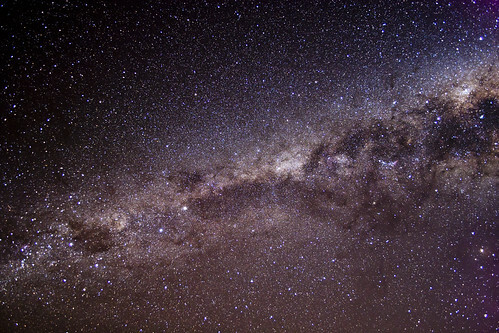 "The Milky Way is nothing else but a mass of innumerable stars planted together in clusters. " 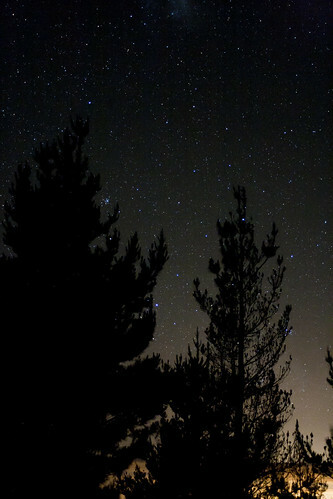 Dark Skies., a photo by Astronomr on Flickr. Desert Rd. Bill, we need to organise a trip! 1200, a photo by Astronomr on Flickr. 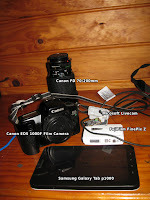 Just bought a 35mm Canon EOS camera off the Trade me ... going to try kicking it oldskool as well as with the Digis. What was over my house! What was over my house!, a photo by Astronomr on Flickr. It's in French, but ... wow. Just wow. 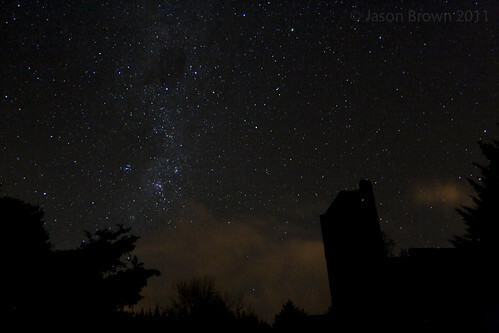 Milky Way over the cement works, a photo by Astronomr on Flickr. Bill and myself, spur of the moment outing to the cement works ... definitely going back! So it's not looking good for the James Webb space telescope that was due to replace Hubble later this decade, due to NASA budget cuts... well, due to greedy hedge fund types ultimately. This kinda makes it all the sadder. Sort yourself out, America - show some freaking leadership and common sense, you're due!